The Monroeville Municipal Authority purchases finished drinking water from the Municipal Authority of Westmoreland County (MAWC). 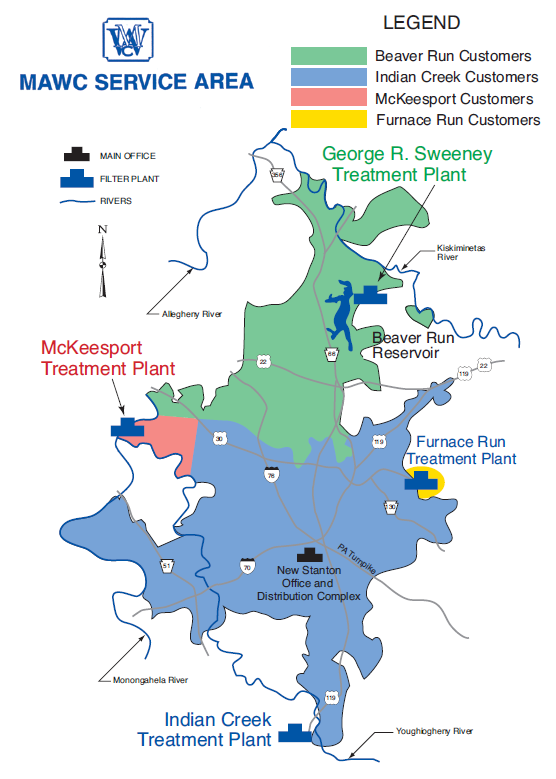 The finished water that is provided by MAWC is obtained from both the Beaver Run Reservoir and Youghiogheny River. The MAWC raw water sources are potentially most susceptible to accidental spills along major transportation corridors, release of raw and/or under treated sewage, and storm water runoff from developed and/or agricultural areas. Also, Beaver Run is potentially susceptible to the cumulative release of petroleum products from nearby tank farms. A Source Water Assessment of MAWC’s intake water was completed in 2002 by the PA Department of Environmental Protection (PA DEP). The source water assessment public summaries can be found on the MMA website at https://www.monroevillewater.org/sweeney and https://www.monroevillewater.org/yough. Complete reports were distributed to municipalities, water suppliers, local planning agencies and PA DEP offices.